Faculty of Allied Health Sciences, Department of Radio-Diagnosis & Imaging organized a Guest Lecture on 12th May 2018 in the Hospital Auditorium. Guest speaker, Dr. Bijit Kumar Kundu, Associate Professor, Consultant Rheumatologist, Dr. RML Hospital & PGIMER, New Delhi, spoke on the topic “Plain Radiography in Perspective of Rheumatologist” in which he emphasized the role of Plain Radiography in Rhematology patients, the techniques & views of radiographs to be taken. He focussed on ABCDs of Rheumatology, which helps in the diagnosis of various diseases related to Joints. Dr. B.B. 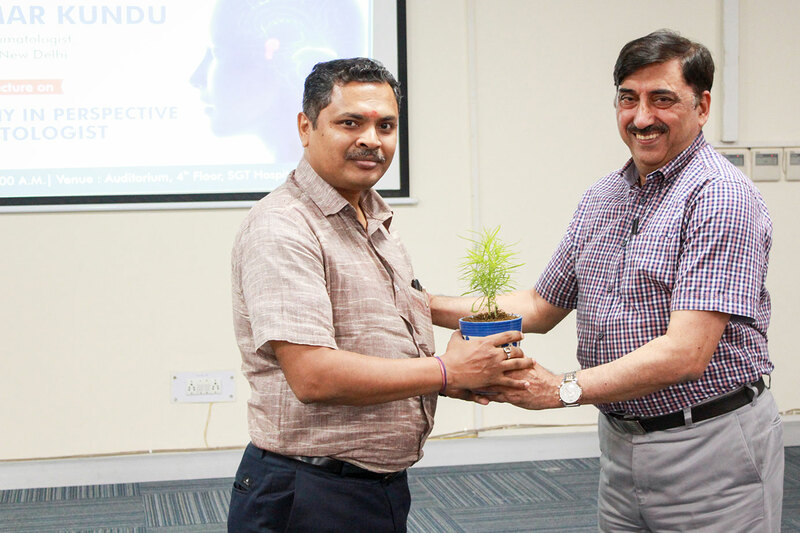 Sharma, Head Radio-Diagnosis welcome Guest Speaker by presenting sapling. Dr. V.K. Govila, Dean, Faculty of Allied Health Sciences presented a Memento to Guest Speaker as a token of love & appreciation. The faculty members of the Faculty of Allied Health Sciences & Faculty of Medical & Health Sciences along with the students were present on the occasion. The lecture was very informative and beneficial for the students. Students urged for more such lectures in the future.